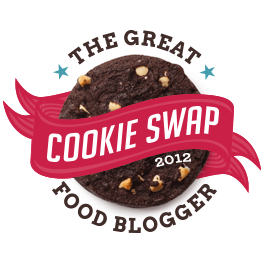 The second I found out about the Great Food Blogger Cookies Swap, I knew I had to sign up. Here’s a quick run down of how it worked. Each participating blogger was sent mailing addresses of 3 bloggers. We baked 3 dozen cookies and sent 12 to each of the bloggers “assigned” to us. Then we anxiously awaited the arrival of our 3 boxes of cookies to arrive in the mail. That’s right everyone that participated received 3 boxes of yummy cookies in the mail!!!!! This year the the cookie swap partnered with Cookies for Kid’s Cancer. Each blogger participating made a $4 donation to the non- profit organization committed to raising funds to support pediatric cancer research. All of the funds raised by the Great Food Blogger Cookie Swap were matched by OXO. For more information about Cookies for Kids Cancer please visit thier website. I am working on hosting a couple of bake sales to raise more money for this cause. I have also set up a DJ’s Sugar Shack donation page. If you are interested in making a tax free donation please feel free to do so here. 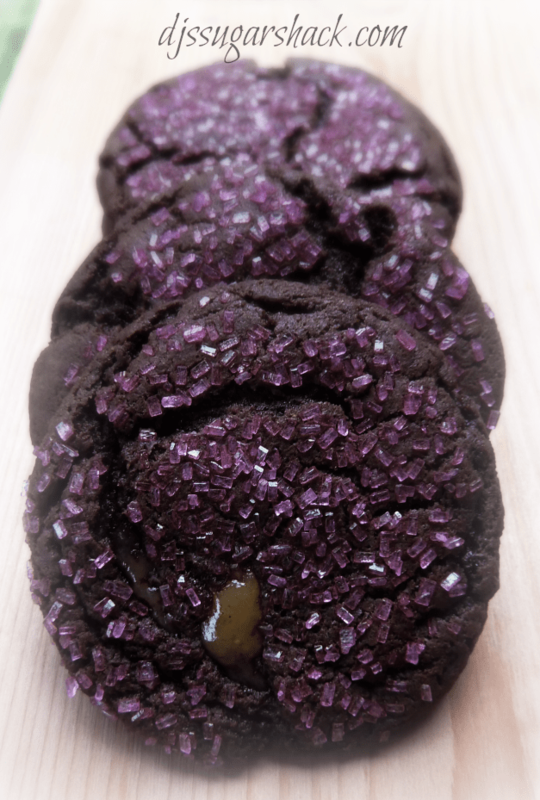 Here’s a peak of the cookies I made for the swap. I used Vanilla Sea Salted Caramels I had left over from an event earlier in the week. Store bought soft caramel candies can be substituted. After stuffing the caramel into the dough sprinkle a small amount of salt onto the caramel candy. Vanilla sea salt can be purchased online or in gourmet food stores. My Baking Addiction has an easy recipe if you would like to make your own. What a great gift for the bakers in your life! 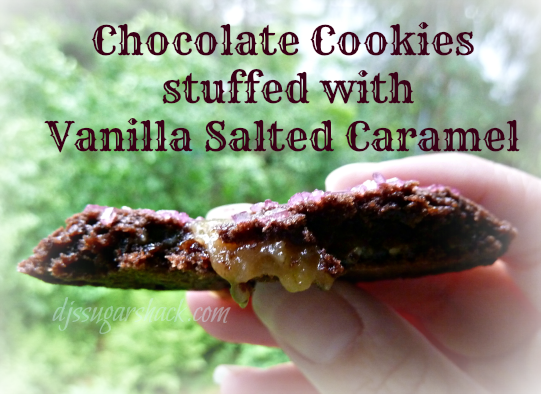 Gooey chocolate fudge cookies stuffed with salted caramel. These cookies are to die for! In a large bowl combine cake mix, eggs & oil. Mix ingredients together until combined. Use a cookie scoop or large spoon to scoop out about 1 heaping tablespoon of dough; stuff caramel into the center of the dough. Roll dough into a ball around the caramel. Place 2 inches apart on parchment lined baking sheet. Sprinkle balls of dough with sugar sprinkles, if desired.